With some of the most beautiful beaches in the world, the Gold Coast is the perfect place to host a beach wedding. Although the beach provides a stunning backdrop for your ceremony, beach weddings have a lot of factors that need to be considered when planning your special day, which is why you need to pick the right people to help plan your special day. Waterside Events at Currumbin are beach wedding experts. They have been creating perfect beach weddings for years, they have the answers for everything you need to consider when planning the perfect beach wedding at Currumbin. The first thing to consider is picking the perfect beach to hold your wedding. At Waterside Events, we think Currumbin Beach and Palm Beach Parklands are the perfect beaches to hold your ceremony at. With volcanic rocks jutting out of the sparkling blue water, spotless sand, lush green grass and shady trees, it’s no wonder these beaches are constantly chosen as locations for advertising campaigns. How are you going to set the scene for your ceremony? All your guests are going to want to have a good view of your ceremony. Making sure you have a few rows of chairs set up for your older guests to sit on is an important consideration, as they won’t be able to stand up for long periods of time. This set up will also allow guests standing behind the chairs an excellent view of your ceremony. Another thing to consider is how much space you are going to need for the wedding party and the marriage celebrant. Would you like a beautiful archway behind you? Would you like to stand on the sand, or would you prefer a platform to stand on? Are you going to walk down a sandy aisle or would you prefer to lay down an aisle for you to walk on? 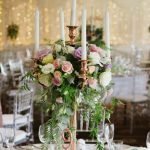 Waterside Events have lots of different styling options that you can peruse when planning your big day. The final thing to consider when planning the perfect beach wedding is when to have it. The bridal party don’t want their beautiful makeup melting during the ceremony, or somebody’s grandmother fainting half way through the ceremony if you chose to have your wedding in the middle of the day in summer. On the other hand, it won’t look great in your photos if all your guests are huddled in their coats shivering if you have a wintry beach wedding. How long is it going to take for the bridal party to get their hair and makeup done? Nobody wants to be up at 6 AM on their wedding day, a beautiful bride needs her beauty sleep. When it comes to planning your big day, Waterside Events at Currumbin know how to create the perfect beach wedding, and they won’t miss a trick. Contact us, today!